Every once in a while you come across an idea, where you need for a way to store large amount of log data and other information for your Arduino project, for example a GPS logger. The solution is to use what’s found in every digital camera and mp3 player: Flash Cards! often called SD or micro SD cards. Their ability to pack GigaBytes of data into a space smaller than a coin made them indispensable thing in our life. 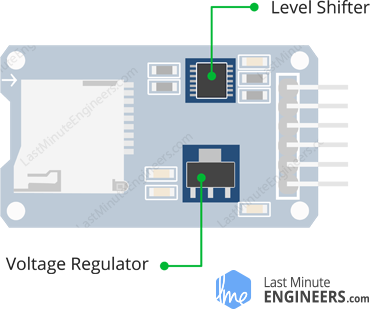 The operating voltage of any standard micro SD Cards is 3.3 V. So we cannot directly connect it to circuits that use 5V logic. In fact, any voltages exceeding 3.6V will permanently damage the micro SD card. That’s why; the module has an onboard ultra-low dropout regulator that will convert voltages from 3.3V – 6V down to ~3.3V. There’s also a 74LVC125A chip on the module which converts the interface logic from 3.3V-5V to 3.3V. This is called logic level shifting. That means you can use this board to interact with both 3.3V and 5V microcontrollers like Arduino. 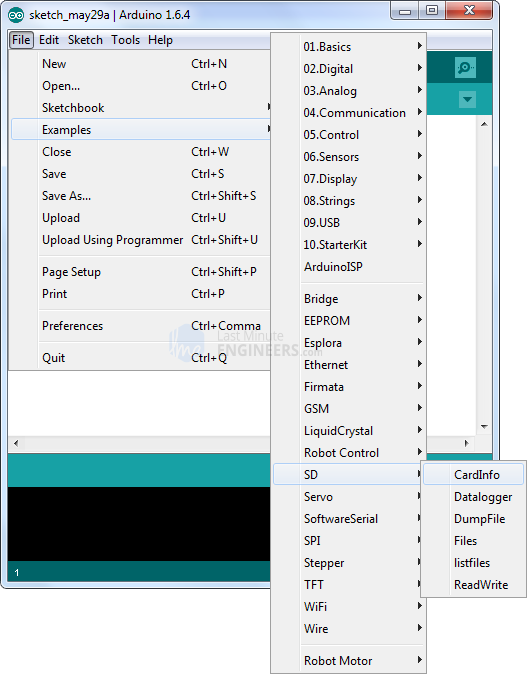 There are actually two ways to interface with micro SD cards – SPI mode and SDIO mode. SDIO mode is way faster and is used in mobile phones, digital cameras etc. But it is more complex and requires signing non-disclosure documents. For that reason, hobbyist like us will likely never encounter SDIO mode interface code. Instead, every SD card module is based on ‘lower speed & less overhead’ SPI mode that is easy for any microcontroller to use. VCC pin supplies power for the module and should be connected to 5V pin on the Arduino. MISO (Master In Slave Out) is SPI output from the Micro SD Card Module. MOSI (Master Out Slave In) is SPI input to the Micro SD Card Module. SCK (Serial Clock) pin accepts clock pulses which synchronize data transmission generated by Arduino. SS (Slave Select) pin is used by Arduino(Master) to enable and disable specific devices on SPI bus. Before you insert the micro SD card into the module and hook it up to the Arduino, you must properly format the card. For the Arduino library we’ll be discussing, and nearly every other SD library, the card must be formatted FAT16 or FAT32. If you have a new SD card, chances are it’s already pre-formatted with a FAT file system. However you may have problems with how the factory formats the card, or if it’s an old card it needs to be reformatted. Either way, it’s always good idea to format the card before using, even if it’s new! 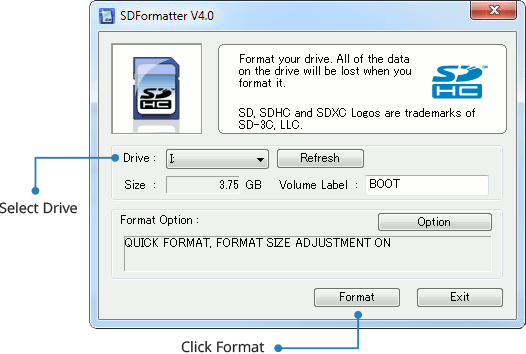 We strongly recommend you use the official SD card formatter utility – written by the SD association it solves many problems that come with bad formatting! Download the formatter and run it on your computer, just select the right drive and click FORMAT. Now that your card is ready to use, we can wire up the micro SD breakout board! To start with, insert the micro SD card module into the breadboard. Connect VCC pin on the module to 5V on the Arduino and GND pin to ground. Now we are remaining with the pins that are used for SPI communication. 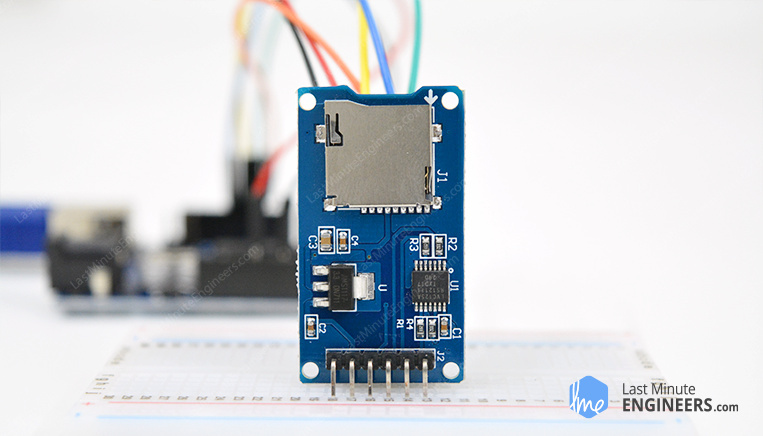 As micro SD cards require a lot of data transfer, they will give the best performance when connected up to the hardware SPI pins on a microcontroller. The hardware SPI pins are much faster than ‘bit-banging’ the interface code using another set of pins. 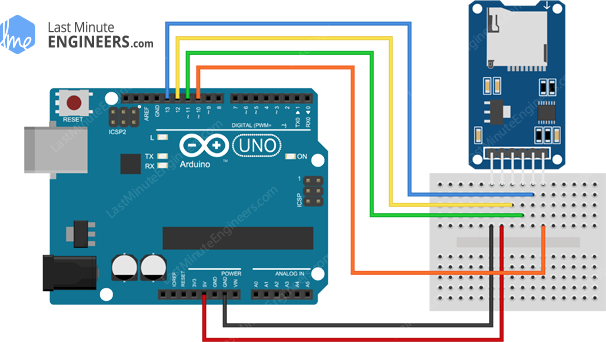 Note that each Arduino Board has different SPI pins which should be connected accordingly. For Arduino boards such as the UNO/Nano those pins are digital 13 (SCK), 12 (MISO) and 11 (MOSI). You will also need a fourth pin for the ‘chip/slave select’ (SS) line. Usually this is pin 10 but you can actually use any pin you like. If you have a Mega, the pins are different! You’ll want to use digital 50 (MISO), 51 (MOSI), 52 (SCK), and 53 (SS). Refer below table for quick understanding. In case you’re using different Arduino board than mentioned above, it is advisable to check the Arduino official documentation before proceeding. That’s it! We are now ready to log some data! 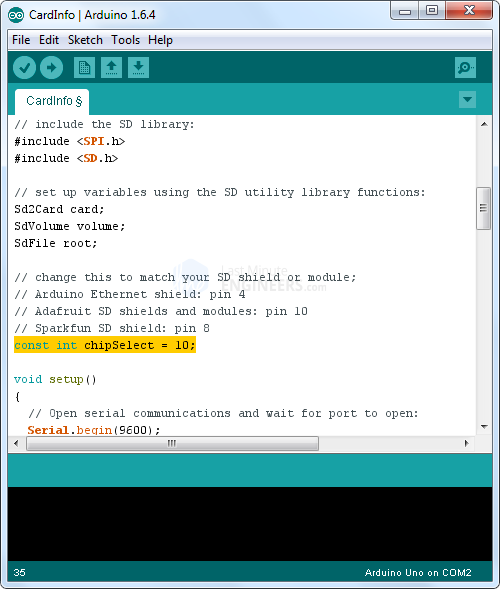 Communicating with an SD card is a bunch of work, but luckily for us, Arduino IDE already contains a very nice library called SD which simplifies reading from and writing to SD cards. You can see it in the Examples submenu. This sketch will not write any data to the card. It just tells you if it managed to recognize the card, and displays some information about it. 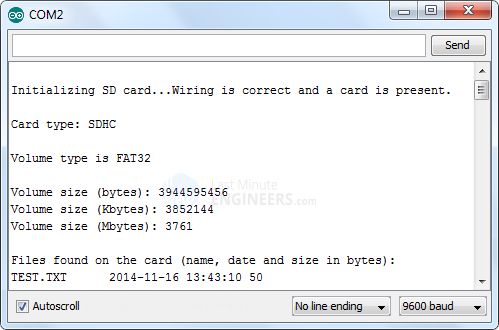 This can be very useful when trying to figure out whether an SD card is supported. Before trying out any new card, we recommend you to run this sketch once! Go to the beginning of the sketch and make sure that the chipSelect line is correctly initialized, in our case we’re using digital pin #10 so change it to 10! OK, now insert the SD card into the module and upload the sketch. You may find it gibberish, but it’s useful to see the card type is SDHC (SD High Capacity), Volume type is FAT32 as well as the size of the card about 4 GB etc. The card mostly responded, but the data is all bad. See there is no Manufacturer ID / OEM ID and the Product ID is ‘N/A’. This shows that the card returned some SD errors. It’s basically a bad scene. If you get something like this, you can try to reformat it or if it still flakes out, you should toss the card. See, it couldn’t even initialize the SD card. This can also happen if there’s a wiring error or if the card is permanently damaged. Considering you have successfully initialized the SD card, we’ll move on to our next experiment. The following sketch will do a basic demonstration of writing and reading data from a file. Try the sketch out, before we begin its detailed breakdown. The sketch starts with including the built in SD library and the SPI library which allows us to easily communicate with the SD card over SPI interface. 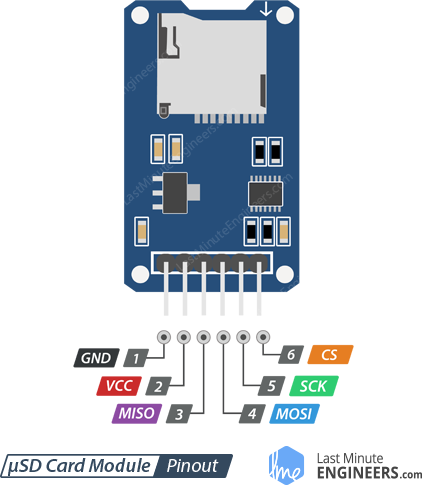 After the libraries have been included, the next thing we do is declare the Arduino pin to which the chipSelect (CS) pin of the SD card module is connected. The CS pin is the only one that is not really fixed as any of the Arduino digital pin. We don’t need to declare other SPI pins since we are using hardware SPI interface and these pins are already declared in the SPI library. After declaring the pin, we then create an object myFile, which will be used later on to store data on the SD card. Next, in the setup() section: We start the serial communication for showing the results on the serial monitor. 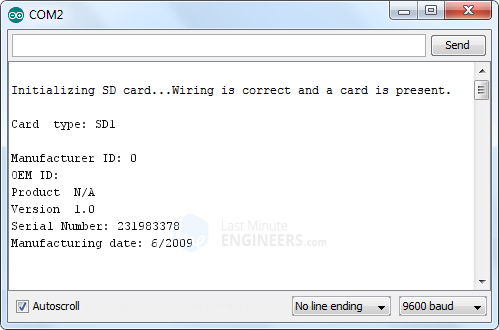 Now, using the SD.begin() function we will initialize the SD card and if initialization is successful the “if” statement becomes true and the String “initialization done.” gets printed on the serial monitor, else the string “initialization failed!” gets printed and the program terminates. Next, the SD.open() function will open the file named “test.txt”. In our case, as such file is not present, it’ll be created. The other parameter FILE_WRITE opens the file in read-write mode. Once the file is opened, we will print the “Writing to test.txt…” message on the serial monitor and then using the myFile.println() function we will write the text “testing 1, 2, 3.” into the file. After that we need to use close() function to ensure that the data written to the file is saved. Now let’s read the same file to check if the write operation was successful.To do that, we will use the same function, SD.open() , but this time as the file “test.txt” has already been created, the function will just open the file. Then using the myFile.read() function we will read from the file and print it on the serial monitor. The read() function actually reads just one character at a time, so therefore we need to use the “while” loop and the function myFile.available() to read all characters in file. At the end we need to close the file. Since this is just a demo sketch to demonstrate how to read and write files, there is no point to run the code multiple times so all the code was placed in the setup() function which runs just once, instead of putting it in a loop() function which runs over and over again. If you reset your Arduino and let the sketch run again; the new data written gets appended to the file without overwriting previous data. Read() only returns a character at a time. It does not read a full line or a number! You must close() the file(s) when you’re done to make sure all the data is written permanently! This reduces the amount of RAM used. You can open files in a directory. For example, if you want to open a file in the directory, you can call SD.open("/myfiles/example.txt") . Note that the file path is relative. The SD card library does not support ‘long filenames’. Instead, it uses the 3 format for file names, so keep file names short! For example datalog.txt is fine but “My Sensor log file.text” is not! If you just want to check if a file exists, use exists("filename.txt") which will return true or false. You can delete a file by calling remove("unwanted.txt") be careful! This will really delete it, and there’s no ‘Recycle Bin’ to pull it out of. You can create a subdirectory by calling mkdir("/mynewdir") handy when you want to stuff files in a location. Nothing happens if it already exists but you can always call SD.exists() above first. You can seek() on a file. This will move the reading/writing cursor to a new location. For example seek(0) will take you to the beginning of the file, which can be very handy!